Apple has used the opening keynote of this year’s Worldwide Developers Conference (WWDC 2016) to officially provide the world with the first glimpse of watchOS 3, the third major iteration of the firmware that powers the Apple Watch wearable. Many current Apple Watch owners, as well as those who have chosen to stay away from the first iteration of the wearable, were really hoping against hope that a second-generation Apple Watch would be introduced at the company’s Worldwide Developers Conference this year. And while that, as expectedly, hasn’t happened, there’s still good news on the Apple Watch front as owners will now rely on the progression of the underlying software to get new features and improve the overall experience of the current Apple Watch model. Here we take a deep look at exactly what was announced for watchOS 3 by Apple at WWDC from a features and release date perspective. 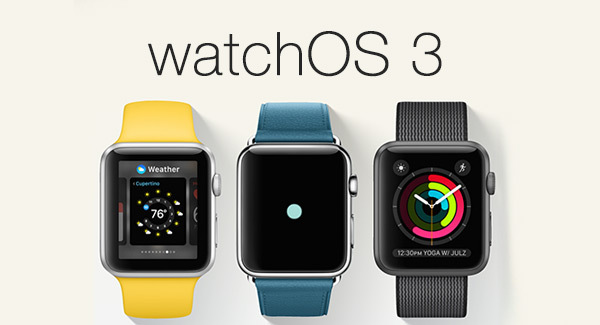 So, without any further delay, here’s everything you need to know about watchOS 3 for Apple Watch. The apps will launch much faster compared to watchOS 2, with Apple introducing the ability for watchOS apps to be kept in memory, along with background updates and refreshed information. Apple is calling it Instant Launch, and sounds quite like the iOS experience. Apparently there’s a seven fold increase in launch times now. What this has also meant that Apple is dropping support for Glances, with these instant faster apps the only way (alongside Complications) to view data from apps. The side button now launches the all-new Dock in place of the the Friends screen that user’s have been used to till now. From here, you can switch between live apps easily. Quite like iOS, watchOS 3 is brining in a dedicated Control Center to the Apple Watch. Swipe up from the bottom for instant access to switches like Airplane Mode, Do Not Disturb, Silent Mode, etc, and also shows you the battery percentage. With this new way to input text, you can simply scribble or draw letters on the screen to type. These drawing will automatically turn into text letters. Useful for sending those quick replies! 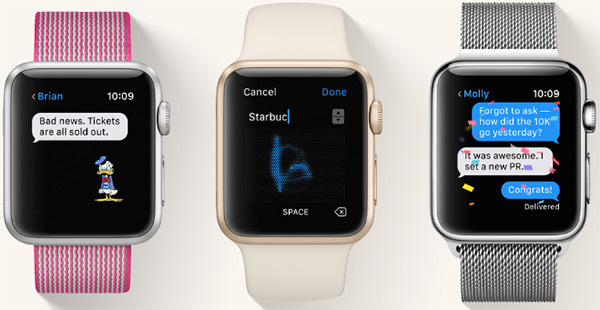 Like iOS 10, watchOS 3 brings in some powerful reply options to messages received onto your wrist, with instant access to the new Scribble option as well. 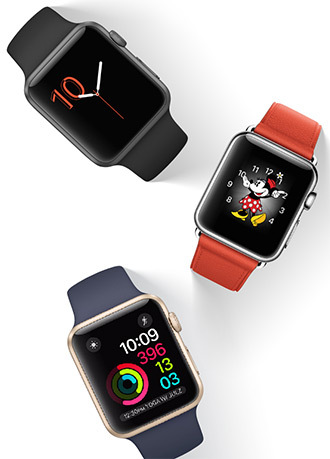 Some new Watch faces are also making their debut with watchOS 3, including a Minnie Mouse watch face, as well as one called Numerals. Apple has also made an Activity Watch face available which lets you monitor your activity throughout the day, complete with Activity rings, which look pretty cool. Apple believes that people are always looking to switch their watch faces frequently, and as such has now made it very simple for changing watch faces on the fly. Simply swipe on a watch face to switch to another one. Apple has completely redesigned Reminders and Find Friends apps for the Apple Watch, making both the apps much more productive on the wrist. Holding down the Dock/Side button for a while will now instantly dial 911. This is a well-thought out addition to the wearable. 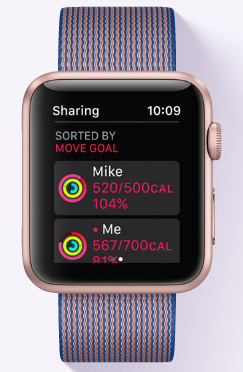 You will now be able to launch workouts directly from the watch face without having to use voice, or apps home screen. You can now swipe right on the activity rings to see data being shared by friends and family, as well as share your own data with others. Furthermore, you will be able to communicate with those they’re sharing their data with via Messages and some smart replies such as “Like a boss.”, “You’re on fire!” etc. Other then Messages, there’s the ability to send voice messages, as well as sharing your hear rate. We’ve been used to seeing the “Time to stand!” message reminding us that we’ve been sitting too long. 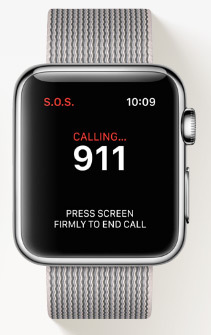 In a similar fashion, this has now been changed in watchOS 3 for wheelchair users. 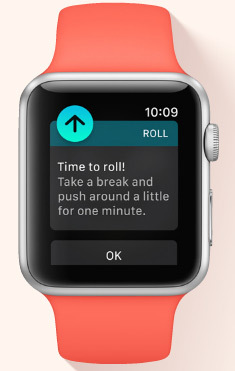 Starting from watchOS 3, you will now get “Time to roll!” alert instead. Sure, walking and standing up is important, but so is breathing. 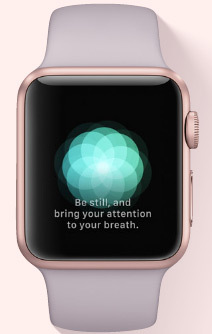 Apple’s new wrist-mounted app will remind you to take some time out and breathe and relax. Close your eyes and let the haptic feedback guide you with when to breathe in and out in a slightly meditative manner as it shows you the heart rate during that period, and the total time you’ve taken out to breathe and relax. Guess the title says it all. Yes, you can now use Apple Pay on the Apple Watch to pay for services and products in third-party apps. You now have access to iOS 10’s Home app for HomeKit-enabled devices for full home automation. Support for fitness apps running in the background, real time hear-rate and location data collection, as well as SpriteKit and SceneKit, and more, really makes watchOS 3 a much improved platform from the developers point of view. watchOS 3 beta is available to developers in a pre-release format today. General availability of the final version of watchOS 3 will be available to everyone this fall. No vibrations on BT disconnect ?